Well, it's Tuesday AND the last day of January...and what could be better than a great home cooked meal you wonder? One that I simply had to reheat (from last night) and pair with a fresh salad and BOOM...dinner is served. I must say, yesterday's chicken tortellini alfredo meal was just as good, if not better, than it was last night. And that is felt not only by me, but my hubby who I would describe as somewhat of a "leftovers snob"...he would never admit it, but he can find one hundred reasons not to have leftovers the next day (i.e., "why don't we go out for Mexican", or "I'm not that hungry, I'll just have cereal" to "I had a big lunch, really late"....and a myriad of other "reasons")...don't get me wrong, most of the time he concedes, but with what could be described as "rather lackluster enthusiasm"! Anyway, what I'm getting to is he raved and raved over tonight's leftover chicken tortellini alfredo meal...even more so than last night....which is a good, not to mention rare, thing in this house. I usually have to re-invent a different meal using leftovers to get that kind of reaction. So, this meal is definitely a "keeper" in our house. One of the "sweetest" escapes comes in squares...oh yeah! Well...Monday is almost over....yeah! Actually it was a gorgeous bright sunny day here...and although I ran a few errands after work, I still had plenty of time to make a delicious dinner afterwards. On one of my earlier blog posts, I posted a picture of a new flavor of Classico sauce..."Roasted Poblano Alfredo" that I had stumbled upon. Anyway, I've been mulling over some ideas about how I wanted to use it. There were a few recipe suggestions that were attached to the jar lid. I took one of them and embellished it....and I must tell you, it turned out wonderful! The recipe consisted of only a few ingredients....a bag of cheese tortellini (I used frozen because I can keep it on hand), grilled sliced chicken breasts, cherry tomatoes (tiny little "Santa Sweets" grape tomatoes), 1 jar of Classico Roasted Poblano Alfredo sauce, 1/4 cup grated Parmesan cheese, fresh chopped Italian parsley....that's it! You can see how beautiful it turned out...and it was as delicious as it was pretty! While hubby grilled the boneless chicken breasts, I sliced and briefly sauteed some sliced grape tomatoes in olive oil (please...if I ever say EVOO...shoot me...that Rachel Ray gets on my nerves after a while)....sorry, back to cooking. So, the chicken was grilling and the tomatoes were sauteing, I chopped my fresh Italian parsley while my cheese tortellini was boiling (which by the way only takes 2 minutes to boil). Eating with your eyes is almost as important as eating with your mouth, don't you think? Well...this meal took me approximately 20-25 minutes from start to finish. And honestly, you'd be hard pressed to find a meal any better at any local restaurant, I promise! It is a feast for the eyes as well as the soul....Bon appetit! Saturday Morning Mommy-MacMuffins, Etc., Etc. It is an absolutely gorgeous bright sunny morning here...we haven't seen Mr. Sunshine in the morning in quite some time! On Saturday mornings, we typically go out for a bagel and coffee breakfast and then run our errands...but this morning it is pretty nippy out (37 degrees) and I just wasn't in the mood to get such an early start. So, I decided to make some "Mommy-MacMuffins" at home for breakfast instead...they are quick, easy and actually much better than those made over at the golden arches. I used to make these for my kids when they were little and we called them "Mommy-MacMuffins". I would typically put sausage on theirs when they were little, but I am not particularly fond of sausage, so I stick to egg & cheese only for mine. Most of the time I use eggbeaters in mine, but this morning I decided to treat myself to a real egg instead. I used a toasted Thomas' whole wheat "double fiber" English muffin along with a slice of Colby cheese melted on top of my egg sprinkled with cracked black pepper...wow...MickeyD's doesn't have anything on my muffins! I paired my Mommy-Mac with a cup of "Donut Shop Coffee" made in my Keurig (did I mention how much I LOVE LOVE LOVE my Keurig?) and this breakfast was absolute heaven....the best part was I got to eat it in my p.j. 's...and we all know that everything tastes better in your p.j.'s! This was a great start to my Saturday morning....bring it on!!! Well, it is now lunch time. Last night was one of those rare nights where I wasn't in the mood to cook and really not in the mood to eat anything out in particular. We hemmed and hawed and ended up running out to pick up subs from Publix....I love Publix subs!!! Why would anyone ever get a Subway sub if they had access to a Publix store and were able to get one of theirs instead....seriously though....hands down, no comparison whatsoever. Anyway, I got a turkey/lettuce/tomato/mayo sub w/ a few pickles (I always get it on whole wheat, but they were out of whole wheat...and since it was nearly 8:00 pm on a Friday night, I forgave them). :-) Hubby got his fave, an Italian sub. So, we ate 1/2 of our sub for dinner last night and saved the other 1/2 for today's lunch....I love that! Publix just happened to have their turkey subs on sale this week for $4.99...so for $2.50 I had dinner and another $2.50 I had lunch....can't beat that. Check mine out below....isn't it pretty? While browsing around Publix while our subs were being made....I stumbled across something that someone I know is going to really like a lot (youngest son). Oh, and in case you didn't already know this about me, I am such a sucker for the word "new" on anything...big time sucker. When my kids were little, my eyes continually scanned the grocery shelves for the word "NEW" (it still does)...they were always on the cutting edge of every new product or flavor that came out...they always carried it to school in their lunchbox first! I like to think it contributed to their academic success too...LOL. Kind of dorky, I know....but it is what I did and still do. Check these guys out below....they also had another new flavor, dulce de leches (caramel)...but I picked up this one last night....check it out. 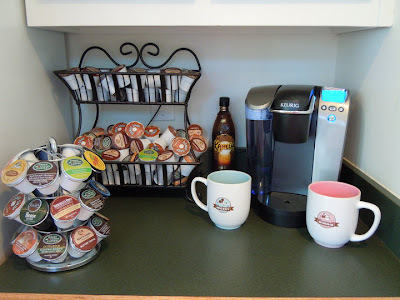 Oh...up above in my breakfast post, I mentioned my favorite coffee, "Donut Shop Coffee", for my Keurig...and part of my "well stocked pantry" means never running out of this coffee either. I usually have at least 100 or more cups of this flavor "at bay" at all times....you never know when you are going to need that jolt of java and I don't ever want to be caught empty handed (or empty cupped)...LOL. 4 boxes X 24 cups = 96 cups in addition to what I have on my counter! Tonight it is another nasty rainy night here in Georgia. It sounds like we have another long night of terrible storms ahead too. Which leads me to sharing my happiness of how much I'm looking forward to my quick and tasty dinner of "leftovers" from Tuesday night's dinner....I added some veggies to the meal by sauteing a medium sliced zucchini in a little olive oil and then tossing in the leftover pasta and reheating it....in less than 10 minutes I have dinner made. Paired it with a fresh salad and we are good to go. Check out the cute little mini Biscotti I found at the store too...it's probably only 1/4 the size of regular Biscotti and the best part (for me) is that it is Dark Chocolate & Almond which are two of my faves. Well, the hubby just got home so it's time to actually go and eat dinner instead of just chat about it....Ciao! This evening, on my way home from work, I stopped at Publix to pick up more of my favorite weekday breakfast...Fage 2% Plain Greek Yogurt....I like to add a dash of cinnamon, a splash of vanilla and a few drops of stevia and I am good to go until lunch! It is full of protein and calcium and it is a quick, healthy meal for me to grab in the mornings before work. I am not much of a morning person....never have been...and obviously never will be...so Fage just works well for me early in the morning! Now, before I show you what I came back home with...you have to first understand one thing....it was on SALE!!! Okay, enough of this yogurt talk....while browsing around Publix I stumbled on some of the cutest little potatoes in town....little tiny gems called "Honey Golds"....and of course, they were so photogenic I just had to take their portrait before cooking and eating them for dinner! So go ahead...take a peek and tell me....aren't they the cutest little devils you've ever seen? Boiled and season to perfection...with sea salt, cracked black pepper and parsley...and just a smidge of butter....I swear it wasn't a stick (for all of you Paula Deen haters out there)! Served those little suckers with baked chicken tenders and baked onion rings. Where is the "green" on the plate you ask? Click on the photo above, and look a little closer and you will see the parsley on the potatoes! This is our "casual food" night...kind of like eating fast food out but not nearly as bad for you and it was all made at home! Well, tonight I worked late again and didn't get home until after 6:00 p.m. I must admit, for a brief moment, I was tempted to just cave in and say, "lets eat out", instead of cook...but that thought only lasted a moment. I quickly regrouped and took a brief inventory of what I had on hand that I could whip together easily. In my pantry, I found a bag of whole wheat Orecchiette pasta...for those of you that don't know what that is, they are small bowl shaped pasta that are great for holding your sauce. I also found a jar of one of my favorite "gourmet" jarred sauces....it is made by Rao's, a tiny Italian restaurant in NYC that has a waiting list over a year long....YES...that's right...a YEAR!!! This sauce is my brother's favorite sauce -- he was the one that told me about it, and once I actually tried it, I understood why it was his favorite sauce. It is nothing like the other jarred sauces you buy in the store -- it really tastes fresh! Now, while I must admit their sauce is awesome, I can't imagine that there is any place worth waiting a year to eat at, in my opinion. I love their Arrabbiata sauce which is spicy; it isn't "burn a hole in your mouth spicy" but it will definitely tickle your tonsils (or in my case my tongue....I lost my tonsils in 2nd grade). Anyway, I also happened to have some boiled boneless chicken breasts left in my fridge, extras left over that I cooked for Sunday night's chicken enchiladas (Perdue is my favorite brand of boneless chicken to use -- it is a much better value because the only thing you will throw away is the package -- they don't hide wads of fat underneath to fool you like some other brands do). My favorite chicken to use is Perdue boneless chicken breasts -- I haven't found any that are as tender or as well trimmed). I always cook a little extra to make another meal or two with. I made chicken salad for last night's dinner with some of the leftover chicken. Tonight I get to use them yet again for meal #3....pretty convenient. I diced the chicken breasts into small dice and tossed it into the sauce while it was heating. When the pasta was done, I tossed my beautiful little pasta bowls into the big pan of sauce and chicken and sprinkled it with shredded Parmesan cheese...and voila...DINNER IS SERVED. Literally, in 20 minutes I had a delicious dinner made. That and a salad and you have an awesome dinner...BOOM! Below are a few pics I will share with you...I love to photograph food -- maybe that is a little weird, but it's harmless! This recipe has 3 ingredients...pasta, sauce and chicken! Enjoy! This is my absolute favorite shape of pasta...not only are they as cute as can be...but they do a great job of holding the sauce cupped in those little bowls and their texture is awesome. "An important distinction in industrially produced pasta is made between bronze cut and Teflon cut - which refers to the molds, or "dies" as they are called, used in production. When Teflon dies are used, the resulting pasta is smooth and shiny. In contrast, bronze-cut pasta is rougher and more porous, producing a more homemade quality. Bronze-cut pasta holds sauces and seasonings in a way that Teflon cuts cannot. ".....I learn something new every day! For a moment, I thought it might actually contain bronze!!! What goes great as a "not too sweet" dessert after an Italian meal you ask? Why, Biscotti, of course...dunked in your favorite cup of coffee! I picked up some Cranberry Pistachio Biscotti at the store this weekend...they are delicious! I also tried a new recipe for Cheesy Mexican Rice and altered it slightly by adding an 11-oz can of Del Monte's Summer Crisp corn. It was really good and the recipe is definitely a keeper. I will post the recipe for the rice below. Added sauteed Poblano peppers, onions and a jalapeno pepper to the enchilada casserole. 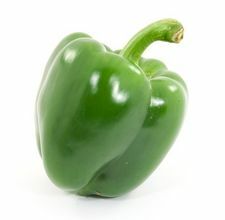 The small peppers on the left are jalapenos; the larger pepper on the right is a Poblano. The Cheesy Mexican Rice had minced garlic, diced onions and diced jalapeno peppers. We skipped lunch today, so it is now "snack time"...nothing like a middle eastern snack to satisfy the munchies on a nasty, cold, rainy Saturday! Heating the pita bread now....yummy! Oh, if you haven't tried these chips yet...you must -- they are awesome! I found this recipe MANY years ago from my Better Homes & Gardens "1976 Second Printing" Cookbook and over the years, I've adapted it to suit my family's tastes. I have used this particular recipe for more than 20 years now...wow, that made me sound old for a split second! I guess this recipe really qualifies as sort of a "retro/throwback" kind of recipe! It also happens to be one of my oldest son's absolute favorite "comfort food" meal. He likes to eat the leftovers cold too...and I must admit, I think it is really great cold as well! Below are pictures of the ingredients that go into this recipe -- most are items that you probably already have in your pantry and fridge. I will add a photo of the actual cooked casserole later! Home Made Marinara Sauce...watch out Ragu, Classico, Prego, etc. Today, it is a dark and dreary rainy day here in Atlanta. It is pouring down rain, thunder, lightning, etc. 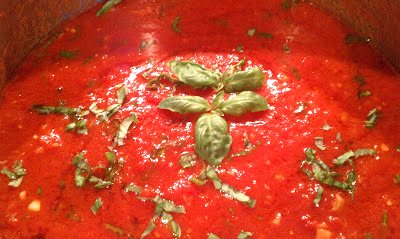 so I thought it would be a good day to post my recipe for home made marinara sauce. This is a "large batch" recipe. 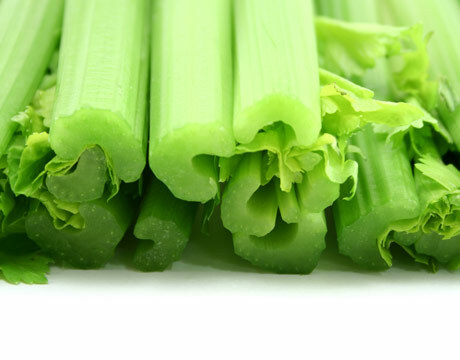 It keeps well in the fridge for a few weeks or you can freeze it to pull out and use later. It is fresh tasting and really good...and of all the different marinara recipes I have tried, this is one of my favorites. It is so simple and contrary to popular belief, doesn't have to cook all day long! This is the recipe I use -- notice it only has a few ingredients. The "star" of this recipe is the San Marzano tomatoes, imported from Italy. San Marzano tomatoes are a type of plum tomato considered by many chefs to be the best sauce tomatoes in the world. Their flesh is thicker with fewer seeds and it is a stronger tasting plum tomato that is sweeter and less acidic. I use the Nina brand which I pick up from my local Costco. This huge (almost 7-pound can) costs about $3.50....yes, you read correctly....no typo here....$3.50. Enjoy! Marinara Sauce - "Large Batch"
Pour tomatoes into a large pot and crush them with a potato masher to desired consistency (I leave mine fairly chunky, it will cook down). In a large saute pan, add about 1/4 cup of your olive oil on medium heat and add your "sliced" garlic and cook until lightly golden brown (be careful not to burn it or it will make it bitter). Next, add your "minced" garlic to your pan (at this point I like to add a splash of white wine to my pan of garlic) and saute a little longer. 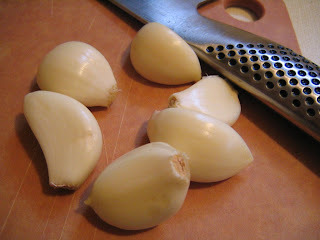 Add your garlic mixture to your pot of crushed tomatoes. Pour in the remaining olive oil, and salt to taste (I also add 1 - 2 teaspoons of crushed red pepper flakes to give my sauce a little zing) and stir well. Bring to a slight boil and turn heat down and simmer uncovered for 45 minutes to 1 hour, stirring occasionally (simmer your sauce until you have reduced it to the thickness and consistency you prefer). While your sauce is simmering, thinly slice your fresh basil leaves (I like to stack them and roll tightly and slice into thin ribbons, chiffonade style -- here is a link so you can see how to chiffonade, if you are interested: How to Chiffonade). 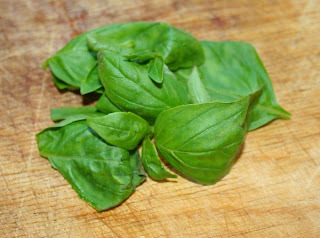 Once your sauce has completed cooking, immediately stir in your sliced fresh basil (it maintains the basil's wonderful fresh taste if you stir it into your sauce after it is cooked). Voila...you have just made your own marinara sauce at a fraction of the cost of "jarred sauce" and you get to control what goes into it. Below are pictures of the simple ingredients that go into this marinara recipe. I am a "visual" person and I like to SEE what it looks like before I make it! I hope your family enjoys this recipe as much as mine does! Zyliss garlic slicer -- it makes slicing garlic a snap! All the above ingredients and approximately 1 hour on the stove will give you this beautiful marinara sauce!!! Who knew it could be so simple??? Used up all my ripe bananas last night...yummy!